I went on complete vocal rest. That means no talking, no singing and no whispering (which puts more strain on your voice than speaking at a low volume). I canceled my lessons and wrote notes anytime I needed to communicate. I even had to run the full show in silence while the stage manager read my lines. (I know complete silence isn’t always a possibility. If you have to speak when you’re trying to heal, try to keep it in your ‘head voice’). I also rested my body. Sleep is important!! I was constantly drinking water, tea, and green juices. I avoided caffeine and alcohol that are detrimental to moisture in the body and the immune system. 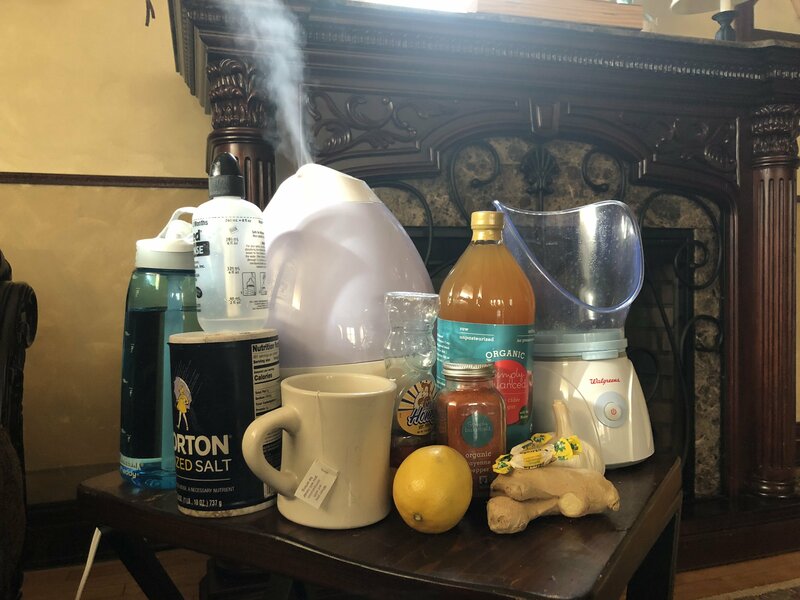 To kick it up a notch, I drank apple cider vinegar (1 tbsp in 1 cup of water) and also ginger root water with cayenne pepper, honey, and lemon juice. As often as possible I breathed in steam (through my nose if I could). This allows moisture to get to the vocal cords, thins mucus and eases feelings of irritation and swollen blood vessels in nasal passages. You can use a personal steam inhaler, run the hot water in your shower, or carefully lean over a pot of boiling water. I also ran a vaporizer around the clock to fight this dry winter air. I frequently gargled with salt water (½ tsp salt + 1 cup water) and used a sinus rinse to flush out irritants and bacteria as well as reduce swelling and loosen mucus. These are things that worked for me but may not pertain to your situation. I cut out meat, wheat, eggs, dairy, and sugar (favorite foods of viruses and bacteria). I slept upright to keep the mucus from settling in my lungs. Even with all of this, it still took more than a week for my voice to return to normal. Every situation will be different. The only person who can truly tell how your voice feels and determine when you’re ready to return to normal vocal activity is you. When you feel ready, start slow. Vocalize on an ‘ng’ or neutral vowel in the middle parts of your range. Monitor the fatigue and listen to your body. My last piece of advice on laryngitis/hoarseness is to avoid stress. The biggest mistake I made during my healing process was constantly dwelling on my fear that I wouldn’t heal fast enough. Stress like this causes tension, which can deeply affect the way your vocal cords operate. Take deep relaxing breaths to open the throat and remind yourself that you are on the road to recovery. Your patience will pay off. Also, remember that I am not a medical professional. Always go to the doctor to get diagnosed, especially if your symptoms include more than hoarseness.